Photography is my hobby, especially THREE DIMENSIONAL. In the past, three-dimansional photographs had to be viewed through special 3D viewers. 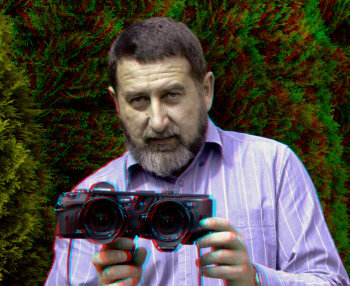 Nowadays, you can put on anaglyph glasses and you can perceive three dimensions at the screen of your computer or laptop. All you need is a pair of "anaglyph glasses". This is a very simple gadget. You can even make it yourself if you really want to. The glasses consist of two transparent -- but coloured - membranes: red on the left and cyan on the right. When you put them on, each eye sees only the particular, corresponding colour on the photograph. However, the brain is very clever and it combines the information from both eyes and creates a three-dimensional vision in your mind. You will feel as though you are there, e.g. in the mountains, and you will feel the distance and size. There is no magic in it, only pure physics. If you are interested, simply TRY and check for yourself.